The second edition of Rome's Nordic Film Fest takes place at the Casa del Cinema from 11 to 14 April. 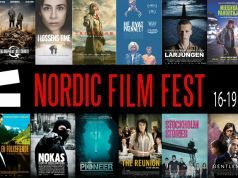 The festival is designed to promote the film industry and culture of the Nordic countries, and includes Italian premieres, documentaries and short films from Denmark, Finland, Norway and Sweden and, for the first time, Iceland. The event is organised with the film institutes of the participating countries and in addition to screenings it will include encounters with actors and directors from the Nordic nations. The full programme will be published soon. The films will all be screened in original language with Italian subtitles and entry is free. As seating is on a first-come basis it is advisable to get there early. Address Casa del Cinema, Largo Marcello Mastroianni 1, tel. 06423601. Casa del Cinema, Largo Marcello Mastroianni 1, tel. 06423601.